diablogging my way through cinematic understandiness. I'm not gonna lie: one of the many things I've learned over the course of this blog is that I naturally distrust and dislike westerns. It's not one thing to blame for this -- I've come to accept that as a genre I just can't get behind them. George Stevens' 1952 stab at the genre, Shane, seems to me so similar to the earlier westerns on this list as to render it indistinguishable. I might be totally wrong, but now that I'm through a couple of these, hopefully I can formulate some legitimate opinions. Company: Kecia was in and out, but mostly out. Cuisine: a cup of coffee from my new Chemex (thanks Christmas! ), then a short break to finish off that seven-layer taco dip from our party last night with the roomie, and then a vodka soda she poured me. Cuisine happens. So the story goes that all the townspeople fear the bad guys, and then a stranger wanders into town and saves them all, and then he leaves. Sound like any other westerns you know? 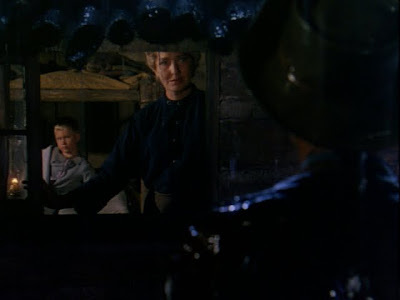 This stranger's name is Shane (Alan Ladd, with his scrawny frame, floppy hair and high-waisted pants), and he resolves to help a homesteader and his family (Van Heflin, Jean Arthur and 11-year-old Oscar nominee Brandon de Wilde) defeat and drive out the baddies, led by cattle baron Rufus Ryker (Emile Meyer). These bad guys' approach on horseback is signalled by menacing, melodramatic timpanis. You know, so you know they're the bad guys before they even appear. 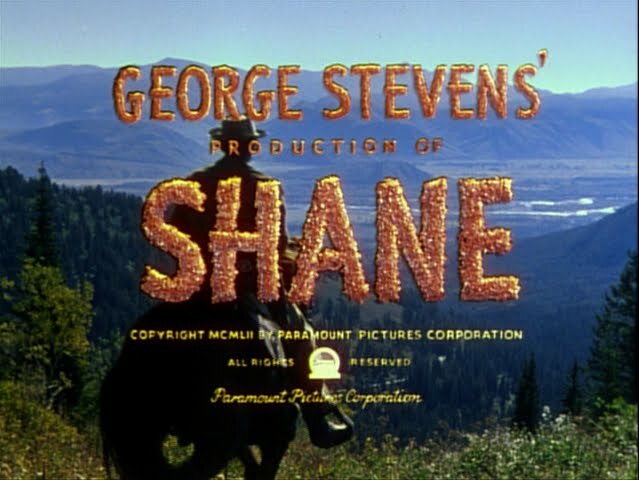 There's actually a moment later where the score doesn't just sound like "Sleigh Ride" (written four years before this film's release), it actually is "Sleigh Ride." As in, there's no difference between what you're hearing and the melody of "Sleigh Ride" (just hear those sleigh bells ring-a-ling, jing- jing- jing-a-ling tooooooo...) To that I say: huh?? Okay, okay. Back off, Max. I tried this time to step back, and look at the film in a larger context ... but no theme pops out to me that I haven't seen before in all the westerns I've ever seen. I think the inclusion of a child in the story, standing safely out of gunshot and idolizing these gunslingers, is meant to comment on the innocence lost in the old West. Fine. 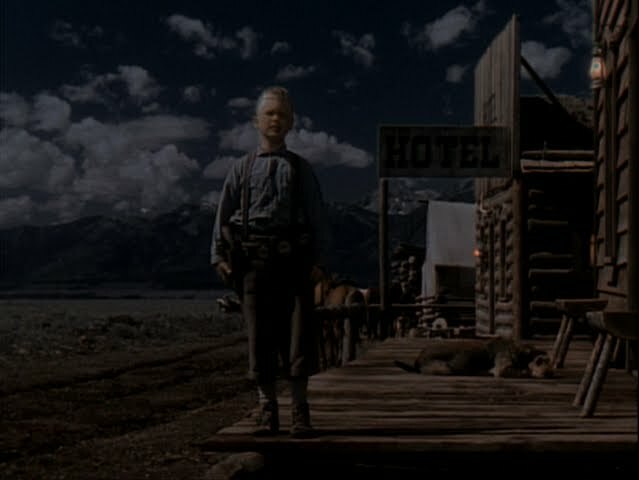 What other western doesn't have a similar longing for a forgotten childhood innocence, regardless of whether or not children are present? These kinds of films were so popular in this time period, perhaps because of my major problem with them: they were all the same. Is that the key? 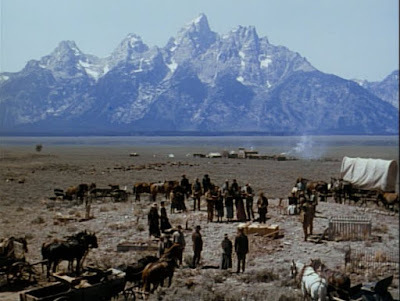 Themes like the quest for freedom, the receeding frontier, the American dream, and badasses with their own rule books run rampant through this genre, and maybe westerns are just like any other major genre: it has its rules and it succeeds most when it plays by them. Keep it simple, stupid! The good guys are good and the bad guys are sneering, conniving and usually ride black horses. All right, fine. 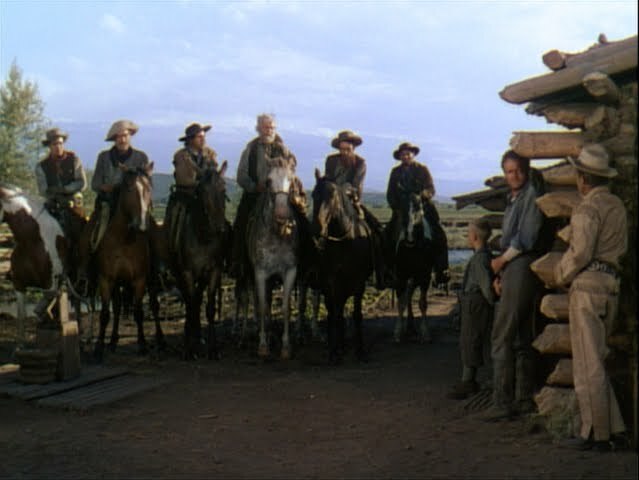 But even so, I have a hard time remembering why I should care about the heroes from these films when they all wear the same clothes, ride the same horse, speak the same dialogue, shoot the same faceless bad guys ... is this an understandable complaint? I only remember this hero's name because it's the title. Otherwise, he might fade into the background like any other. 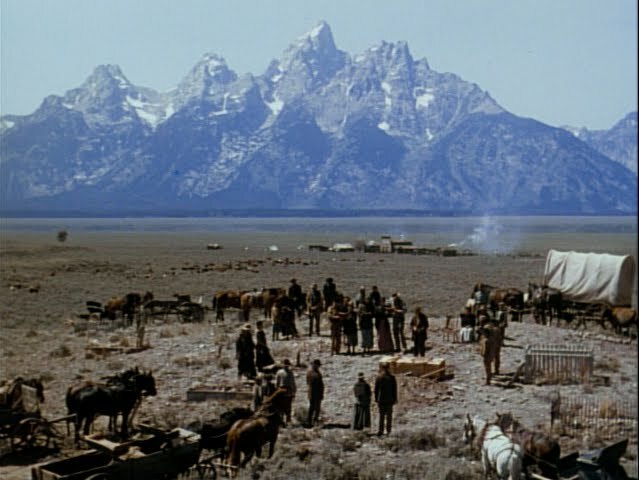 Life ain't easy in the old West. Yeah. Tell me about it. Luckily, I don't feel like less of a film fan for claiming little interest in this genre. I can still see a beautiful shot, hear a well-scripted scene, appreciate a thematic triumph on screen ... but maybe with this bias I might have to look a little harder in some cases. There are some legitimate reasons specific to this film, though. For example, the fights here are preposterous. 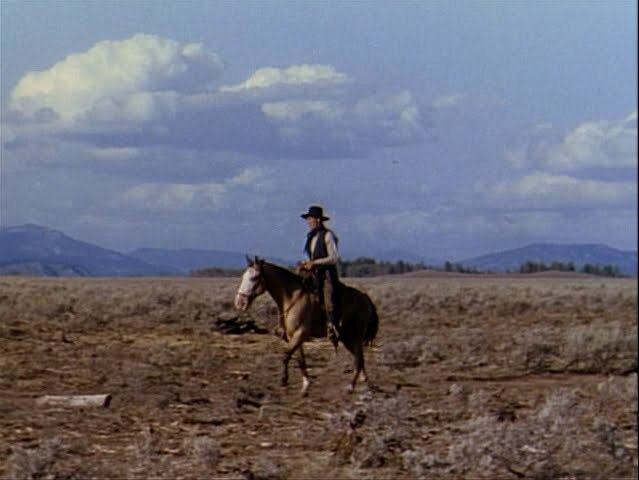 In other westerns I've seen (few though they are), the punches have actually looked like they're hitting someone, and they're aurally synced. Same with the guy playing harmonica at the funeral -- how much was that actor paid to look like he'd never even held a harmonica in his life? I noticed details like that. Did I want the film to fail for me? No. I wanted it to be good. I'd want to like any film, and especially when I want so badly to understand why this genre has so many films on this list (and so many more to go). Ultimately, even though it may be hard to understand, Joey's mother explains to him that "Shane did what he had to do." But wait, doesn't Shane (and any other hero in this genre) abide by his own rules? Did he have to do what he did, or was he just being a jerk? Shane tells Joey that "a man has to be what he is." Wow. Such vague wisdom that works to justify anything. I'm guessing many of the voters for this AFI list were probably boys around Joey's age when Shane came to town, and remember the film so fondly that they kept it on the list. Maybe since I didn't grow up with this, I don't have the same fondness for it -- but would I include my childhood favorite on a list like this? Well... maybe. It depends. Jurassic Park? Possibly. Honey, I Shrunk the Kids? Probably not. The Neverending Story? Ha. It leaves me with much to discuss. How well does this nearly-dead genre hold up? Sure, we have modern westerns -- many of which I've enjoyed -- but I don't see much to compare between this and, say, 3:10 to Yuma or No Country for Old Men. Are these films still truly resonant to a contemporary audience, or are they just relics, antiques we can't bear to sell at our garage sale? Hmm. Next up: Katharine Hepburn, always a palate cleanser, in The Philadelphia Story. That's me. That guy. The one with the face. Performer by day, cinephile by night. Just finished blogging my way through the AFI's Top 100 Movies, beginning 1/1/2010 and ending on 3/27/2012! Well, now I'll have to think of something else to put in this box. NOTE: I am not taking credit for any movie images posted on this blog. All of the images are from films that are protected by copyright and their usage here is not intended for infringement. What Did It Get Me? No reason. I just like it.